The oldest daughter of our friend requested horses as her motif - and turquoise as her color! 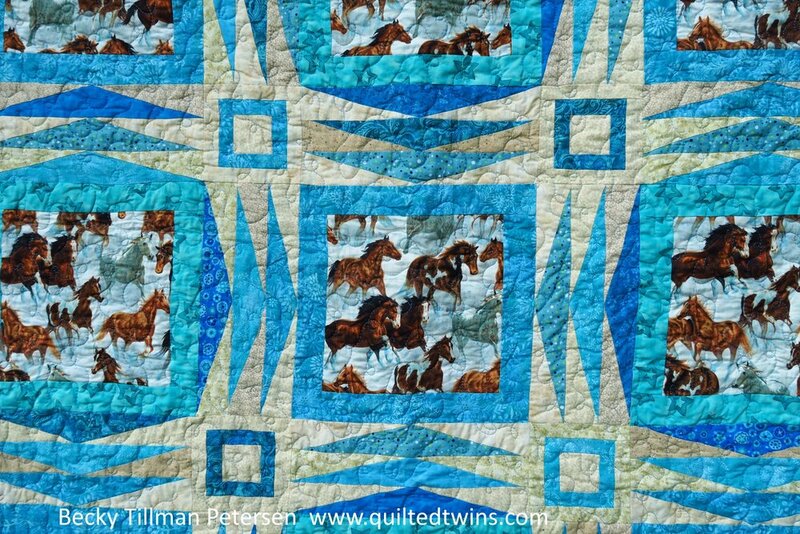 When someone says they want a quilt to be horse themed and then with turquoise - well, I can't help but think Southwest. With the theme of Southwest, I think of Native Americans - or American Indians as some people know them. I have grown to appreciate the colors of this part of the world more since our mission board is located in Arizona. It seems like they use a lot of triangles in their native designs so I decided that them as a main element. i did loops quilting, as I did all three of the sister's quilts. This design came about by my desire to incorporate big blocks with triangles but not too many! I was trying to get these done rather quickly, so I had to design something that didn't literally have hundreds of them. If you know anything about my designs or projects, I'm not actually afraid of lots of piecing! However, I did need to get these done in a week - from idea to finished quilt, and, if you remember, i wanted to keep the novelty/feature fabric - featured. That's what the girls loved - that's what they were getting! 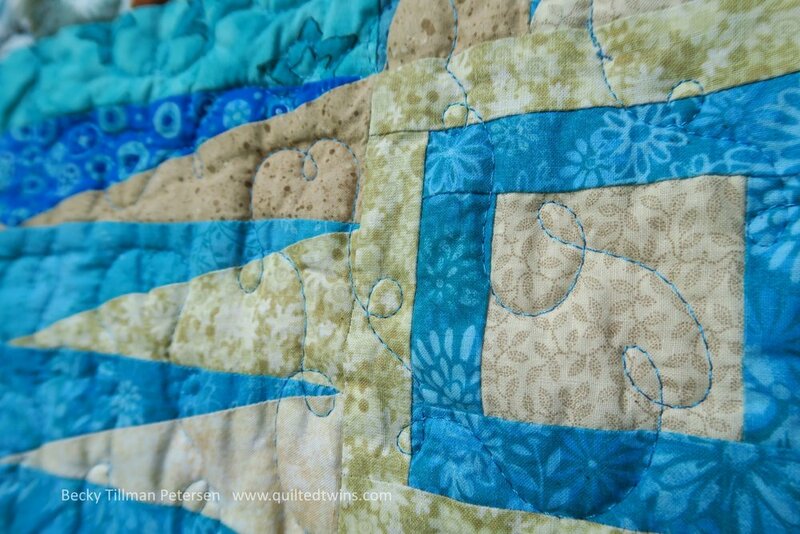 I liked how the effect of the sashing makes you look towards a block or away from a block. 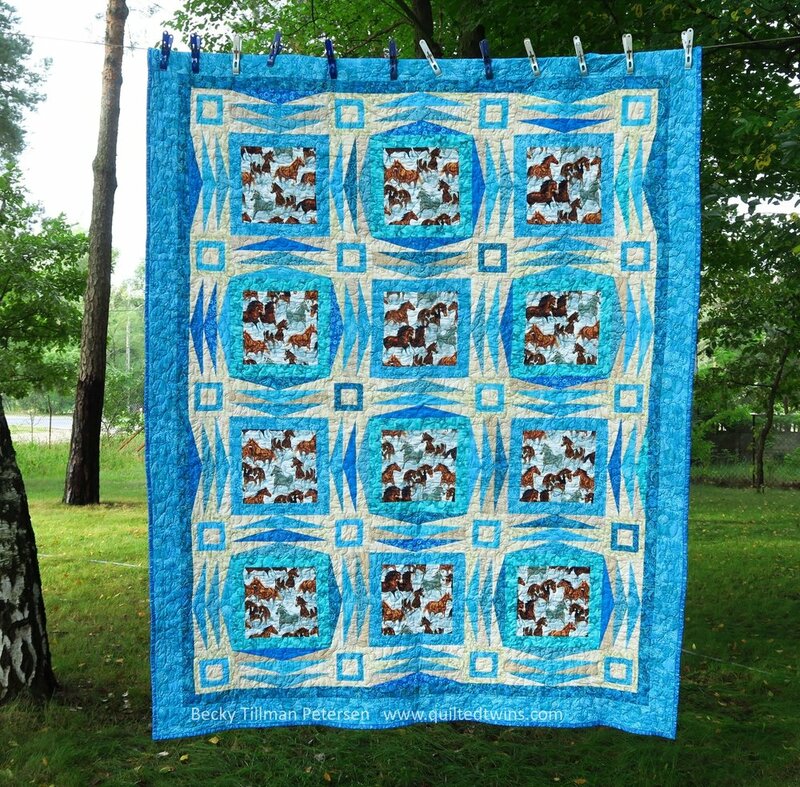 If I would have had more than one horse fabric that went with turquoise, I would have used it for more variety. But I didn't. I was thrilled to have one! 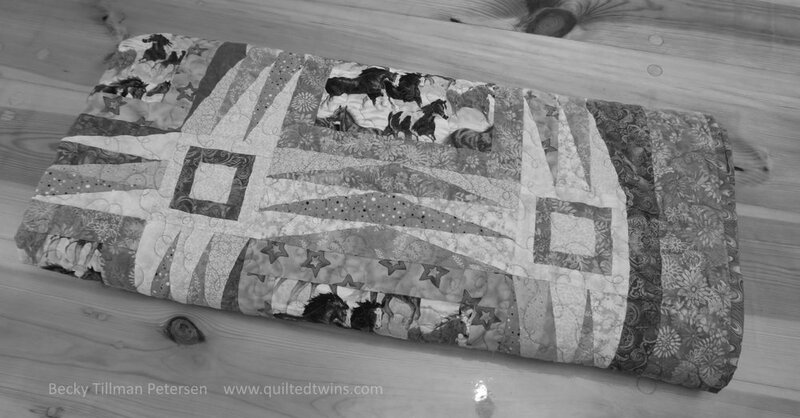 As I've mentioned when discussing the other two girls' quilts, their mother is from the Ukraine. That means their grandparents live there still. These Russian dolls are adorable and are a perfect reminder of their home - or at least their mom's home. They've lived multiple places since they've been born. I'm sure "home" for them is wherever mom and dad are! i chose to go with red on the back because this daughter's other favorite color is red. So...why not use it? Red and turquoise look great together! Just to be different, I thought I'd change the colors here to black and white just to see. I was playing around, truthfully, and thought it was an interesting look! Our days are getting shorter and the leaves are going to start falling soon. I'm glad I've been able to get these pretty green backgrounds for you this summer! The pattern is on the free patterns page. Check it out! And that's at least one of the things that has happened lately here in my sewing room! Don't forget to check out what my sis has for you over in the store. She's working hard to try to keep you in the fabrics you love! For some reason, we received this fabric pre-washed.